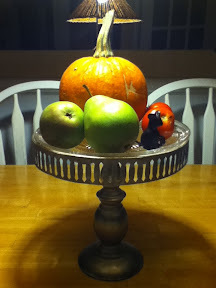 I wanted something seasonal for my table, but not necessarily "Hallowe'en". I decided to go with a traditional "harvest" theme, and incorporate things I already had in my home. This is so simple and cost-effective to do! •Antique cake stand (but you could easily substitute for a pretty plate or silver tray). 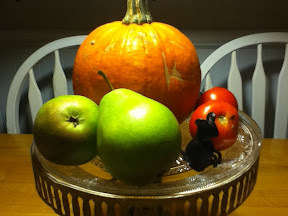 •Small pumpkin (the only thing I bought new for the centerpiece). •Two pears (I had bought a basket of them, and this is a great use while I'm waiting for them to ripen!). •The last two tomatoes from my potted garden. •Antique iron mouse figurine, but again you could easily subsitute for something else. Really easy, and so many variations you could do. I plan on changing out the mouse for one of my animal skulls a little closer to Hallowe'en, and maybe adding some twigs.